There’s no shame in losing to Brazil. And there’s no certainly no shame losing 2-0 to Brazil in a managing debut. 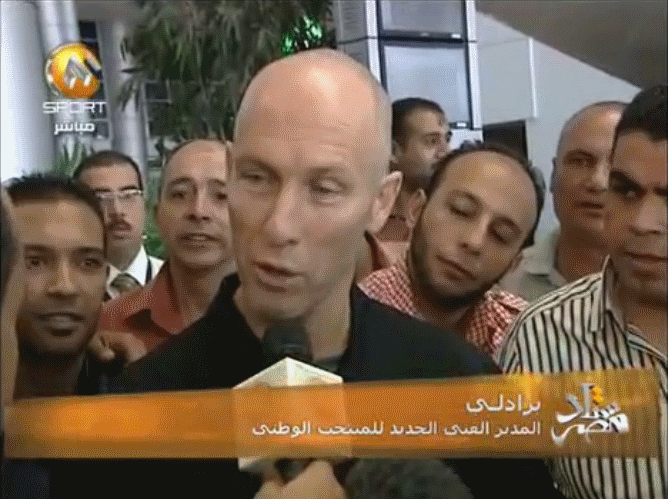 We’ll admit, though, that we wanted more from Bob Bradley’s opening match as Egypt’s manager. We’re excited to watch this next stage of his career, and getting a positive result against the 5-time World Cup champions would have been a great way to start it off. An in-form Brazil prevented that from happening. Bradley's 4-4-1-1 struggled defensively against Brazil's 4-2-3-1, and though his second half 4-5-1 did a bit better defensively, there was little threat in the attack. Bradley’s formation shouldn’t have been too unfamiliar for US National Team followers, as Bradley elected to open with a 4-4-2 (Brazil used a 4-2-3-1). Fans of FFG, however, probably noted that this wasn’t the same 4-4-2 he opened games with for the USA. Instead of constantly sending his forwards wide while bringing in the outside midfielders, he used a more traditional 4-4-2/4-4-1-1. 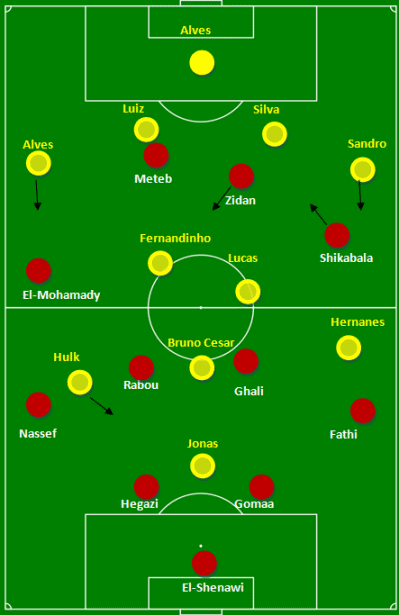 Mohamed Zidan often dropped into the midfield in an attempt to equal numbers in that area. Unfortunately, even the prodigiously talented Zidan was unable to help the Egyptians hold possession in the middle of the pitch. Instead, Egypt looked to swing the ball wide. Almost all of their threatening possession came from the flank. Brazil at times struggled to contain the wingers and fullbacks, particularly right midfielder Shikabala. Shikabala also drifted inside on occasion, though he didn’t have as much success with this tactic. And to be fair to Brazil, they never really looked too concerned about giving up a goal from the run of play. Egypt, though, were a bit lucky to end up just two goals down at the end of regulation. In the first half, Hulk’s rampaging runs from the right wing caused all kinds of havoc, and the Brazilians generally had little difficulty moving the ball through the midfield. Bradley, with his experience playing a 4-4-2 against top-class opposition, knew that was a risk. Though their midfield was often bypassed, the center mids and center backs did an admiral job breaking up play on the edge of the final third. However, this led to plenty of free kicks for Brazil, which is where the breakthrough eventually occurred. After a free kick was punched out by keeper Ahmed El-Shanawi, Hulk was left unmarked and boomed a cross in front of the face of goal. Striker Jonas pounced on the delivery (39th). The second tally also followed a free kick, with more poor set piece marking allowing Jonas to bag a brace (59th). While the goal didn’t exactly go against the run of play, the Egyptians defended better in the second half. Bradley switched to a 4-5-1 at the interval and though there were a few shaky moments as the squad adjusted to the change, they seemed much more comfortable coping with Brazil’s midfield. But the change wasn’t without a price, as the attack became more anemic. Lone striker Emad Meteb might as well have not been on the pitch. Bradley needs to find a way to bridge the gap between the danger (however slight) presented by the 4-4-1-1 and the defensive solidarity brought by the 4-5-1. Gringos, were you able to watch this game on ESPN3? What’d you think about Bradley’s choices? Are you as excited as we are to see an American in charge of another international team?